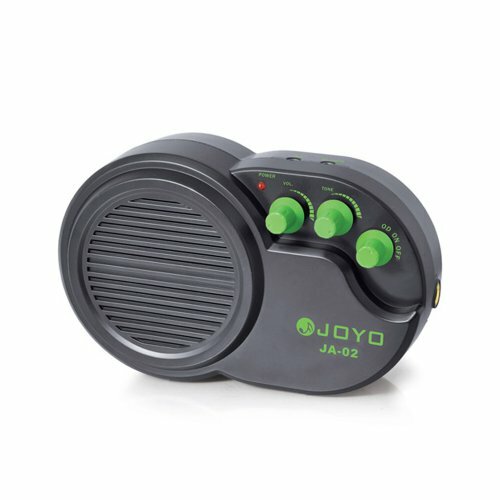 The Joyo JA-02 is completely portable, with a 9V battery included, but also can run off a 9V DC power input (sold separately) in case you will aren't taking this baby on the road. Perfect if you plan on playing out in the shed (you wouldn't know) to avoid the wrath of mom 'n dad in case you cranked the half-stack up real late at night! Tempting, right? What's more, there are features to keep you inspired and playing at your best. Here's the rundown: Connect an external audio source, such as your cell-phone audio player, laptop, CD or MP3 player, to the 3.5 Stereo input. Jam along with whatever you'd like: Volume for your signal can be mixed with AUX source. The two classic tones are enough for any musician to be satisfied in an impromptu jam session on the bus, in the streets or wherever else the mood strikes! The volume and tone knobs are smooth and reliable (no scratchiness or harsh peaks). The durable ABS shell-casing is sturdy and sleek looking (also protects the speaker). There is a bright LED indicator so it's hard to forget you've got the unit turned on still when you're finished playing. With the great tone and powerful output, you will hardly to be able to set the JA-02 down. 3W Speaker Output - this thing gets loud!